Fed up with ham and turkey? 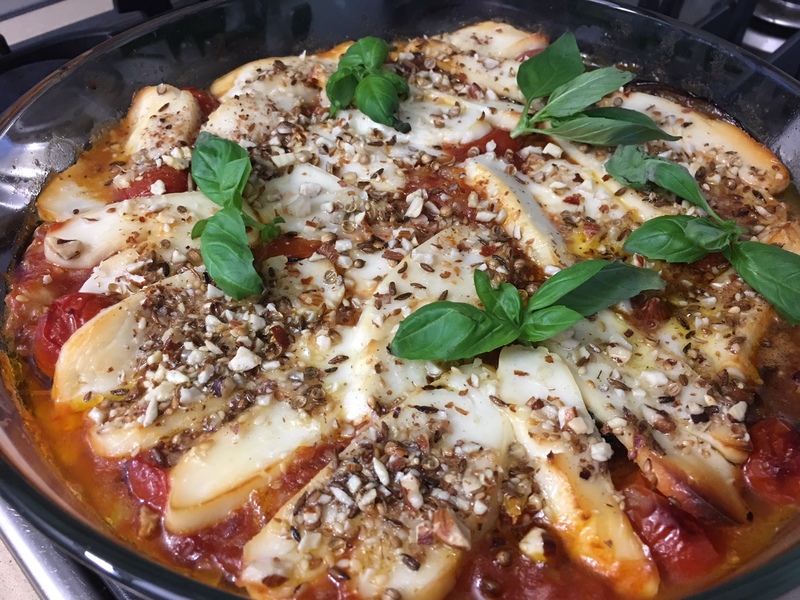 Here’s a quick vegetarian dish made with eggplants, tomatoes and halloumi cheese. Halloumi is a semi-hard cheese which originated in Cyprus. I first ate it at a lunch hosted by my brother and sister-in-law at an Airforce base in the UK where they were stationed nearly 20 years ago. They cooked the halloumi on the barbecue and our kids decided to rename it squeaky cheese, because of the noise it makes as you bite into it. Some eggplant recipes involve lots of frying. This method doesn’t, making it truly quick and easy. Preheat oven to 180°C. Place eggplant halves in a baking dish in one layer, cut side up. Make deep cuts in the surface of each, one way and then the other, so you cut the flesh into squares but not right through. Brush with one tablespoon of the olive oil and season. Bake for 30 minutes or until eggplant is tender. Meanwhile heat another tablespoon of olive oil in a frying pan and add onion and garlic. Cook gently for a few minutes till soft but not brown. Add the tomatoes and sugar, season to taste, then simmer for 5-10 minutes to thicken a bit. Spread over the eggplant. Slice halloumi cheese and arrange over the top. Brush the halloumi with the third tablespoon of olive oil. Sprinkle with dukkah, then put the dish back in the oven for 25-30 minutes or until halloumi is golden. Garnish with fresh basil and serve with a mixed salad. Substitutions: use fresh, peeled tomatoes instead of a can; use a different cheese such as sliced cheddar or Manchego (hard sheep’s cheese from Spain) or whatever you have. 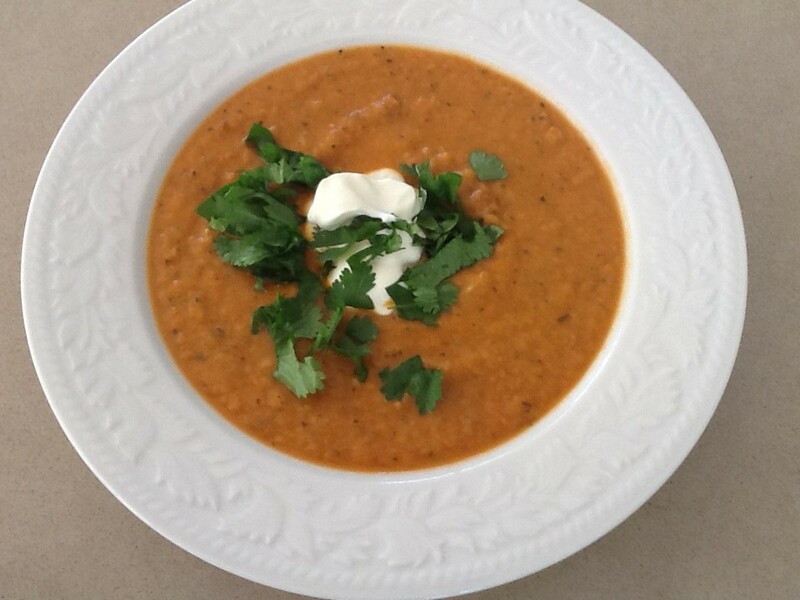 Semi-dried tomatoes, sold in the deli section of most Australian supermarkets, were the inspiration for this colourful recipe. If you can’t buy them where you live make your own by slicing some Roma tomatoes in half lengthwise and putting them on a rack, cut side up, over a shallow tray in a low oven (about 140°c), sprinkled with a little salt, pepper and sugar, for 3-4 hours. When they look somewhat shrivelled and semi-dried remove and drizzle with a little olive oil. You don’t want too much moisture left in them or the tart will be soggy. As we ate this delicious tart we agreed that toasted pine nuts would be a good additional garnish for next time. Preheat oven to 180°C. Roll out pastry and use to line a large metal tart tin. Prick all over with a fork then bake blind (without filling) for 10 minutes or until lightly browned. Meanwhile heat oil in a large frying pan and cook the onions gently for about 15 minutes or until soft. Add the sugar, salt and balsamic vinegar and continue to cook, stirring, for 5-10 minutes longer. Add half the water, stir well then continue cooking, stirring often, until it has evaporated. Repeat with the rest of the water. Turn off heat. Spread onions over base of tart. Top with tomatoes and arrange the crumbled cheese in between. 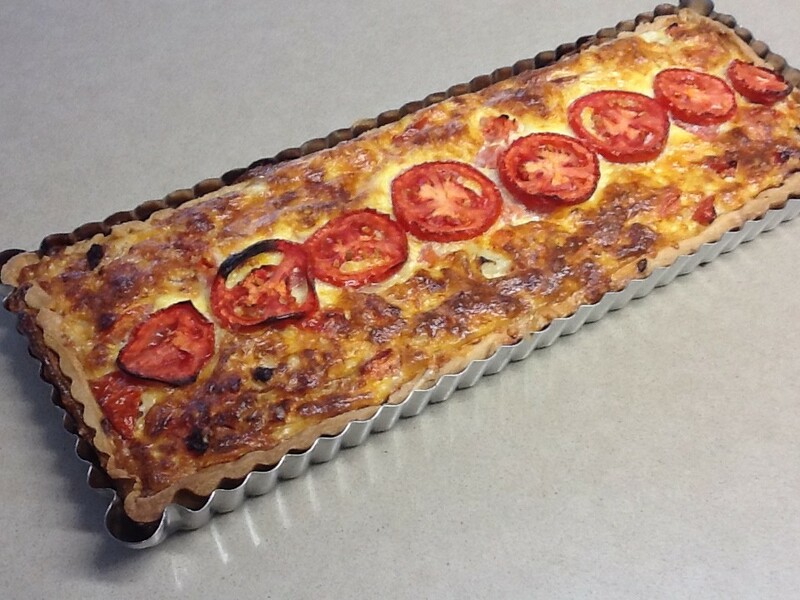 Bake for 25-30 mins or until pastry is golden brown and the cheese and tomatoes are starting to brown. 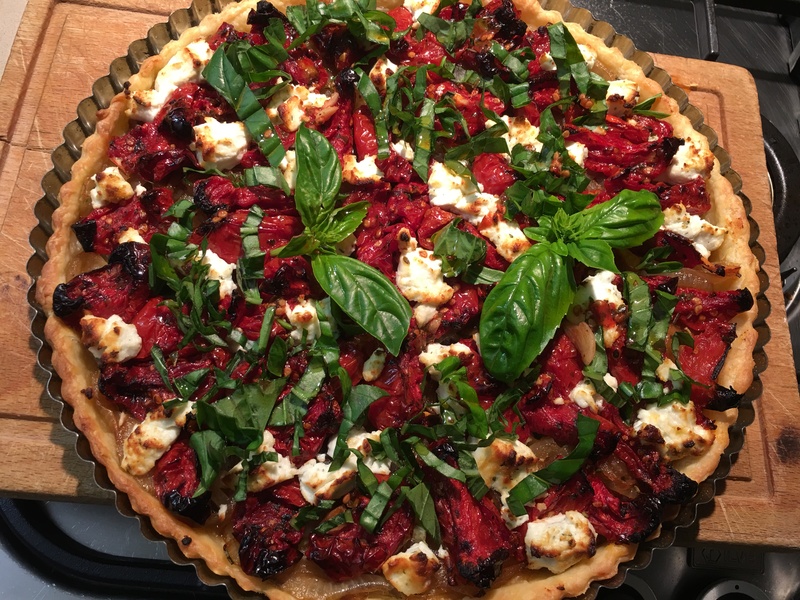 Cool tart for 10 minutes, then serve garnished with fresh basil leaves (and pine nuts if using) accompanied by a simple green salad. This colourful salad is perfect for late summer entertaining, when tomatoes are at their best and you may have some in the garden. 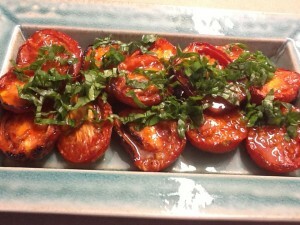 Halve tomatoes and arrange on one shallow serving dish or 2 individual plates. 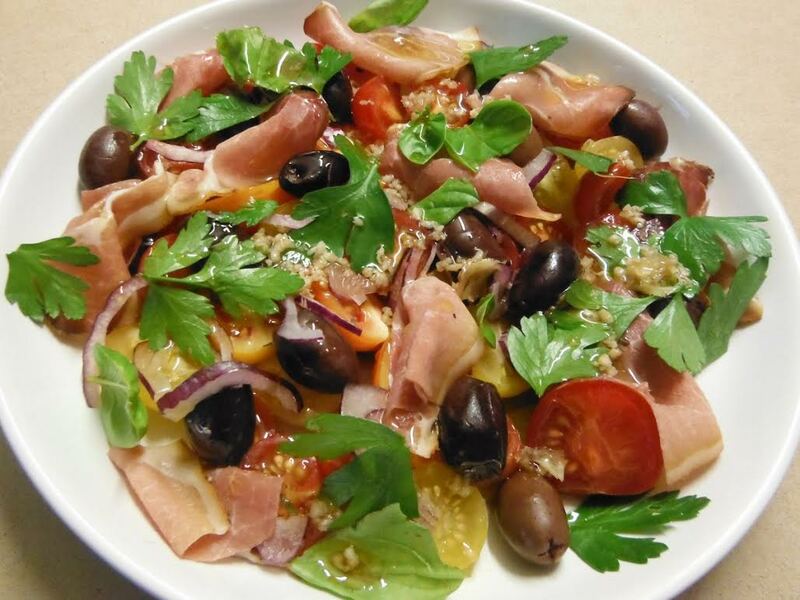 Cut jamon slices into about 4 pieces and arrange in between the tomatoes. Scatter with the olives and onion. Shake dressing ingredients in a jar and drizzle over. Garnish with the torn basil and parsley leaves and serve with crusty bread. Variation: add some cubes of Spanish manchego cheese. Or feta or goat’s cheese. I’ve recently received two reader’s requests. One from my Chilean friend Sonia who remembers a Roasted Tomato Salad I made when she came to our house in Santiago, Chile. It was given to me by my friend Ferne. The other is from my American cousin Anne who remembers a cheese and tomato flan I made when she was in England in the 70s. Fortunately I have a similar memory when it comes to food and knew immediately which recipe she meant. The tomato salad needs to be made with Roma tomatoes because round varieties contain more water and don’t hold their shape. Once prepared the salad will keep for several days in the fridge. It’s a fantastic addition to a buffet or barbecue, perfect to have in the fridge over the holiday season and fairly quick to make when you’re asked to “bring a plate”. Being asked to bring a plate to a pot luck lunch or dinner is quite common in Australia. My Greek teacher, Michael Kazan, told us that when he first arrived in Canberra over 40 years ago and was asked to bring a plate he was somewhat perplexed. If your host hasn’t got enough plates, they’re probably short of everything. So he and his wife turned up with plates, glasses and cutlery. Use your favourite shortcrust pastry recipe for the Lancashire flan, or buy it. Preparing the right amount of pastry and filling to suit your tin/dish is always hit and miss. 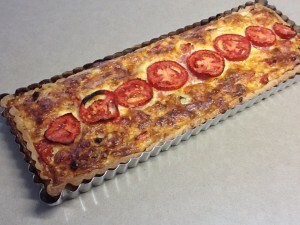 Quiche tins and dishes vary in their capacity, even ones with the same diameter. I made up 250g of pastry (250g flour and 150g butter, plus a dash of water) and used the rectangular tin shown in the photo. There was enough pastry left to make another small quiche shell which I partly cooked then froze empty, to use on another occasion. Preheat oven to 200°C. Halve tomatoes lengthwise and place cut side up on a cake cooling rack over a baking tray or dish. Line the baking tray with baking paper to save on the washing up. 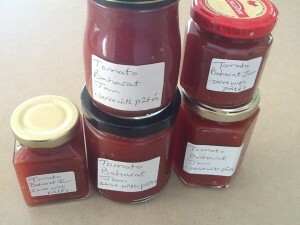 Mix garlic, chilli sauce and olive oil and brush generously onto tomatoes using it all up. Bake 30-40 mins or until starting to brown. Remove from oven and cool to room temperature. Arrange in a serving dish. Place oil and vinegar in a jar with a lid and shake well. At serving time spoon over some dressing and sprinkle with basil. Serve at room temperature. Preheat oven to 180°C. Line pastry case with foil and fill with corn or something similar to give weight. Bake for 5-10 mins until pastry has set. Remove foil and cook for a few more minutes until light golden, remove from oven. Meanwhile fry lardons or chopped bacon in a non-stick pan until lightly browned. Drain and scatter over the base of the pastry case, then sprinkle onion, chopped tomatoes and grated cheese evenly over the bacon. Beat eggs, cream and milk, season to taste and pour over. Arrange sliced tomatoes over the top. Bake for 30-40 mins until puffed and golden. Serve cold or at room temperature. Note: lardons are chunky bits cut from thickly sliced bacon or speck.